This was publishes as a Wall Street Journal Think Tank column on May 24, 2016. Gallup polling released last week showed majority support–58%–for replacing the Affordable Care Act with a federally funded health system. The same poll found 51% support for repealing the ACA. There is a basic point that often gets lost in reaction to poll findings like these: They measure the public’s initial response to ideas and words, and proposals such as single payer or ACA repeal that people associate with candidates–but they don’t tell us much about the likely level of support for a policy if there is a real debate about legislation before Congress, with winners and losers laid bare. It’s always a fair bet that support would decline for big changes that come with big trade-offs–whether it is single-payer health care or ACA repeal or something else–but there is no way to know those levels in advance, and support could rise or fall depending on how a legislative debate plays out. Consider single-payer health care as an example. 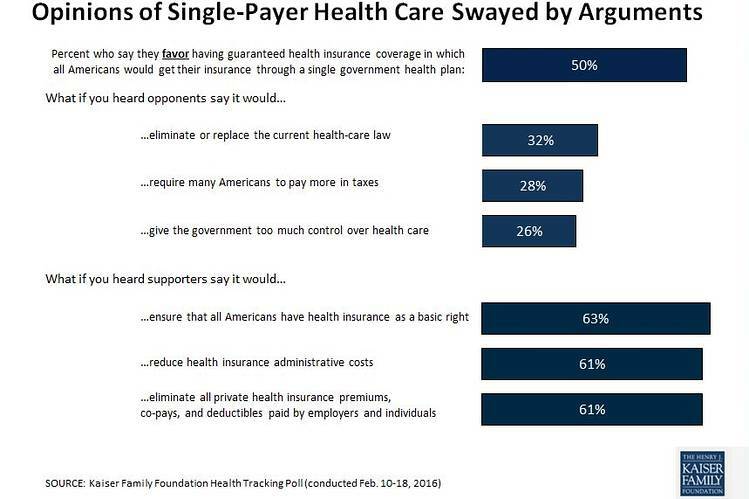 In February, the Kaiser Family Foundation monthly tracking poll simulated some of the arguments the public might hear in a debate about single payer. The same could be true in a debate about legislation to repeal the ACA. Opinion about the health-care law has been stubbornly partisan and resistant to change. But the prospect of the 20 million people who have gained coverage becoming uninsured again if the ACA is repealed could shift some ACA critics who support repeal into the other camp. Or, if there are Republican alternatives to the ACA that people find plausible and attractive, some ACA supporters could move in the other direction. How opinion changes in a legislative debate depends on not only the arguments or the facts but also on who is making the point, how influential and credible those sources are, and the potency of their messages. Put another way: Polling questions asked now about ideas such as replacing the ACA with a federally funded health-care system don’t tell us much about which way public opinion would break in a real national debate about single-payer health care, repealing the ACA, or any other major health legislation where partisans and interest groups can be expected to take to the airwaves and there will be winners and losers.